Safety-clip for holding pens and pencils. US patent US800141 A. Patented Sept. 26, 1905. Lewis Waterman invented the modern fountain pen in 1883. In 1885, when the company was called the “Ideal Pen Company, a young farm boy named William I. Ferris began working there. 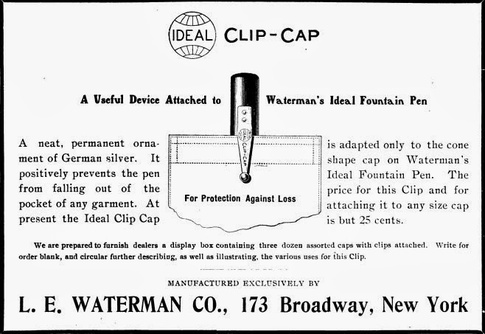 From 1887 through 1927, Ferris would patent at least 13 types of fountain pens or fountain pen accessories. Waterman now makes its high-end fountain pens in France. 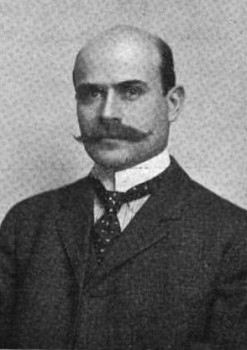 William I. Ferris was born in Greenwich, CT, about 1867, the son of Nathaniel Betts Ferris and Louisa Keeler. He was a fifth great-grandson of Jeffrey Ferris through his son, Joseph. Ferris married Charlotte Pauline Meister in Manhattan in 1903. They had a son, Irving, and a daughter, Ruth. In the 1910 and 1920 censuses, the family lived in Westfield, NJ. Ferris died under mysterious circumstances, falling overboard from his yacht in Oyster Bay, Long Island Sound on July 4, 1929. His body was not recovered for several days.